The Only Hot Tub designed for You! Bullfrog Spas are premium hot tubs with patented technology, personalized just for you. The only hot tubs to feature the one-of-a-kind JetPak Therapy System, Bullfrog Spas allow you to select your favorite massage, place it in your favorite seat and interchange massages at any time. Each JetPak is engineered to provide a specialized massage sensation so you are empowered to create a soothing and completely personalized hot tub experience. the best hot tub for you and your loved ones. It's no longer the 1980s and we don't believe today's hot tubs should be built the same way they were then. Bullfrog Spas engineers reliable modern hot tubs, manufactured with cutting-edge technology. Bullfrog Spas are born from hi-tech design technologies and the finest modern materials. The durable support structure is precision-formed from long-lasting composites instead of wood. Ergonomic seating environments are conceptually designed with cutting edge 3D software, then hand-finished and formed into a strong acrylic surface. 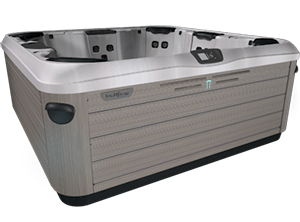 Each spa is finished with reliable components and equipment and is backed by the best hot tub warranty available today. Built to function reliably and simply for years to come. Engineered to be better, Bullfrog Spas are the world's only luxury hot tubs equipped with the patented JetPak Therapy System. JetPaks are modular hot tub jets that can be interchanged at any time now or in the future. 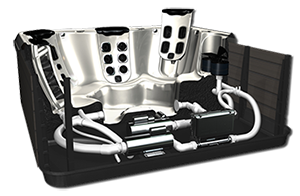 The JetPak Therapy System delivers incredible power, maximum massage versatility, and allows you to upgrade your spa's jetting with new JetPaks anytime.